In 2015, the healthcare industry was worth estimated $3.24 trillion dollarsand are projected to grow up to $3.78 trillion dollars over the next three years. Additionally, a 2012 survey reported that nearly 117 million Americans, or about half of the adult population, at least, one of the following diseases: cancer, diabetes, heart disease, pulmonary conditions, stroke, or hypertension. The healthcare industry is one of the largest economic industries in the United States. With nearly half of American adults suffering from chronic disease, people are beginning to adopt more holistic approaches to medicine. The 2015 National Statistics of Health Reportfound that nearly one-third of all Americans have turned to healthy, alternative options when it comes to medicine, opting for vitamins, minerals, and naturally occurring substances such as fish oils. With nearly a third of the entire United States population for a target audience, the demand for gelatin capsules has never been higher. But, every medicinal product needs a capsule. What type of gelatin capsule is right for your product? More importantly, where can you buy empty capsules in bulk? Capsule Depot is the worldwide distributor for empty gelatin capsules, available for purchase in bulk and delivered around the world for an affordable price. With thousands (five thousand, to be exact) of options to choose from, the world of capsules can be difficult to navigate. In this article, we’ll discuss gelatin capsules and the options they have to offer. Gelatin capsules, also known as soft gels, are made of 100% animal protein. Why? Because gelatin has proven to help aid in the digestion of the materials within the capsule, helping to body to better absorb the contents of the pill. Gelatin capsules also help to mask unpleasant tastes like fish oils or BCAAs. When it comes to flavors, Capsule Depot has a wide variety. From berry to bubble gum, to mint, to coffee, and nearly everything in between, Capsule Depot can help mask the bitter taste of vitamins, minerals, and medicinal products with a pleasant tasting capsule. Capsule Depot reports that the best-selling capsule flavors include berry, lime, mint, coffee, and bubble gum. Not sure which flavor to purchase? Capsule Depot has a “party pack,” with all of the different flavor options inside. Each flavored pill has a color to match their flavor. For example, berry flavor is a purple-maroon color, while lime is green. Flavored pills only come in their correlating color. One of the best ways people differentiate their medications each day is by size and color. Capsule Depot has a large variety of colored capsules to choose from, including blues, purples, yellows, bi-colored, black, and clear. Colored capsules are wonderful for disguising medicinal products, especially when the product does not look especially appetizing. All colored capsules are flavorless, and should work well with nearly every type of product you put into it. On the other hand, clear capsules are available if you are looking searching to find a capsule that displays your product. This is a unique way to approach marketing, and can suggest a certain air of transparency. Capsules are flavorless, and should work well with nearly every type of product you put into it. All colored capsules are flavorless, and should work well with nearly every type of product you put into it. However, certain products with overwhelming tastes like fish oil might not be the best option for a flavorless capsule. Capsule sizes range from 000 all the way to size 4, with 000 being the largest and 4 being the smallest. Capsule sizes should depend on the product you are putting into them, and how much of that product is needed for one dose. Some vitamins and minerals don’t need much to prove effective while others should be taken in larger amounts for proper absorption. The 000 size is nearly an inch long, similar to a large multivitamin or a big antibiotic. While large sizes offer more room to fit your product, they can also prove more difficult for the consumer to swallow. Choosing a flavor for a large capsule like a size 000 would be the most winning combination to reduce gagging in consumers for its large size. Size 00 can holds roughly 570 mg and is about a third smaller than size 000. If you’re looking for a large capsule to contain all of your product, but you don’t want swallowing the pill to be a challenge, size 00 is the right choice for you. Size 00 comes in all available flavors and color combinations and is a great universal capsule for any product. Size 0E is just as long as size 00 but has less girth. Like size 00, this is an ideal size for the consumer, because swallowing the pill is easy--no flavor necessary (although flavors are fun!). Size 0E is a little larger than most pills, measuring about 0.78 inches, but is more slender and therefore still an easily palatable pill. The “normal” pill size, if there ever was one, is size 0. Measuring 0.72 inches in length, size 0 is the standard and most common pill. It is easily swallowed and has very high consumer ratings, and is available in both flavors and colors. Because it is such a common sized pill, it might be a good idea to look for a unique capsule color or color combination, so that consumers can easily distinguish the difference between your product and their other medicines. Size 1 measures 0.64 inches, a smaller capsule with substantially less room to fill. While these capsules are easy for consumers, they might prove difficult to condense your product into that small of an amount while maintaining the recommended amount of dosage. More potent powders are recommended for this smaller size. However, the more potent powders could mean a more bitter taste, in which case a flavored size 1 might be the best way to go. All flavors and colors are available in size 1. Size 2 is an easy 0.59 inches for consumers, and yet another universally recognized capsule. These capsules work well for many stronger powders. 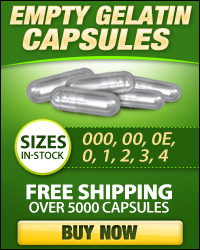 Sizes 3 and 4 are the smallest capsules, measuring 0.53 inches and 0.47 inches, respectively. These capsules are the most popular amongst consumers, probably for the fact that they are the smallest and, therefore, easiest to consume. Again, on the distributor side, smaller capsules means less product consumed, so check to see how much product is needed for one dose. All flavors and colors are available in sizes 2, 3, and 4. Are you developing a product for pets? Capsule Depot is 100% natural, Kosher, BSE-free gelatin, and come in enticing flavors such as bacon, chicken, and beef. No more force-feeding your furry friend, or disguising the pill in treats only to be spat back out on the floor. Give your product an edge in the pet product market with delicious flavors that pets will love. All pet capsules are available in every size. Is your target audience health-conscious? Not all capsules are created equal. While gelatin capsules contain animal matter that makes the product inside more easily digested, Capsule Depot also has 100% vegan-friendly capsules. These chlorophyll capsules are made completely of plant matter and contains absolutely no animal product or byproduct. This capsule is great for vegetarian and vegan alternatives. The chlorophyll capsule is green and is available in all capsule sizes. The Health Industry is worth over $3 trillion dollars and doesn’t appear to be slowing down. Fortunately, so is the holistic market. Health businesses have a large clientele base, nearly half of the American adult population has a chronic disease such as cancer, diabetes, heart disease, pulmonary conditions, stroke, or hypertension. Nearly 117 million people swallow pills daily, which means that the demand for pills is high and will continue to grow with the health trends. Thankfully, Capsule Depot supplies empty capsules of every shape, size, color, and even flavor in bulk, and with worldwide delivery. Whether you are a holistic person harnessing the power of vitamins and minerals, or packaging up dietary supplements, Capsule Depot is the most affordable, highest customer satisfaction ranking capsule company on the market. Give your product a unique, professional look and set your product apart by selecting a unique color combination or flavor, and see the difference.